Ticket’s to Microsoft’s annual developers conference have sold out in record time this year. Microsoft sold out of its allocation of tickets in around 20 minutes last year, but tickets disappeared in just a minute today. Developers now have to sign-up to a waiting list to try and get tickets. The conference takes place on March 30th through April 1st in San Francisco, and is designed to provide the first look at the future of a lot of Microsoft’s software for 2016. While the price has increased from $2,095 to $2,195 to attend this year, a lack of free hardware giveaway has clearly not discouraged developers from attending. It’s not clear exactly what Microsoft will cover in its Build keynote this year, but expect to hear a lot more about updates to Windows 10, cloud services, and perhaps some more apps coming to multiple platforms. This year, Microsoft’s Surface Pro has been flattered by the introduction of similar devices like Apple’s iPad Pro and Google’s Pixel C, but today the original tablet-laptop hybrid gets its own update. The Surface Pro 4 is now official, and it’s thinner, lighter, and more powerful, while also having a larger display than its predecessor. 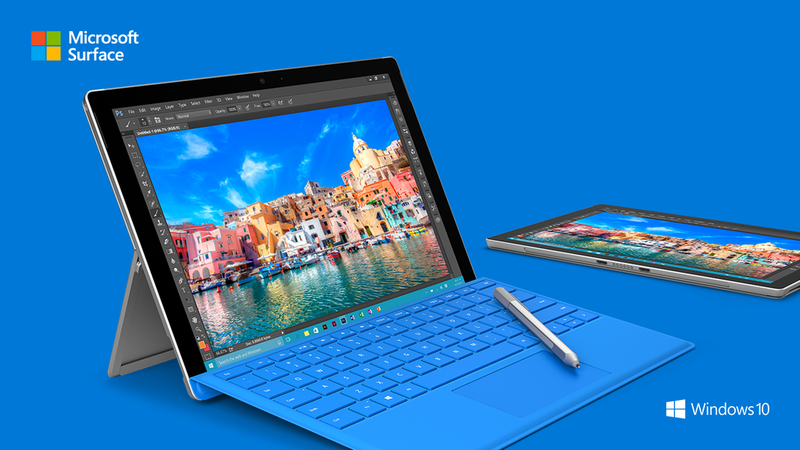 Intel’s Skylake processors and Microsoft’s own Windows 10 are at the heart of the Surface Pro 4. Panos Panay introduced the Surface Pro 4 by reminding us how transformative this line of devices has already been: “This challenge of the tablet and the laptop… which do you buy? Remember that problem? It’s gone.” There’s a fingerprint sensor on the keyboard and Cortana integration inside the new tablet, which fits a 12.3-inch display in the same physical footprint as the older 12-inch device. The Surface Pro 4 is therefore compatible with existing keyboard accessories, though Microsoft has done a ton to upgrade its keyboard covers this year. And yes, there’s an all-new Surface Pen as well, which also has an eraser on the end of it. The new pen has 1,024 levels of pressure sensitivity and attaches magnetically to the side of the Surface Pro 4 when not in use. It comes in a variety of colors and even has Cortana integration: you can activate Microsoft’s voice assistant by holding the button on the stylus. Microsoft says this is the “thinnest, most powerful” Intel Core PC ever shipped and it’s “not even close.” To make that possible, the company has tweaked and optimized multiple aspects of the design that are invisible to the user, such as the 0.4mm-thick Gorilla Glass 4 covering the front. Microsoft has even developed a special G5 chipset to run the optical stack. The promise is that this is the best, most natural touchscreen out there. Notably, though, Microsoft isn’t comparing the Surface Pro 4 against other tablets, with Panay saying that they’re just not in the same class. Compared against Apple’s MacBook Air, however, the Surface Pro 4 is claimed to be 50 percent faster, while it also has high-end specs that wouldn’t be out of place on an ultrabook laptop. Storage goes all the way up to 1TB and you can get 16GB of memory to go with that Intel 6th-gen processor. About 11 stocks advanced for every 4 decliners on the New York Stock Exchange, with an exchange volume of 571 million and a composite volume of 2.8 billion as of 3:59 p.m. Average volume for the entire day is 3.4 billion. The Dow Jones industrial average traded about 220 points higher, with Microsoft and DuPont leading most blue chips higher. The index recovered recent losses to trade about 0.80 percent higher for the year. The Nasdaq Composite jumped 1.5 percent as Apple and the iShares Nasdaq Biotechnology ETF (IBB) rose more than 1.5 percent. The S&P 500 held near 2,100, led by a rise in information technology stocks and consumer discretionary’s 1.3 percent gain to an all-time high. The Dow transports also briefly advanced more than 1 percent, with airlines leading gains. He said the S&P 500 breaking past 2,100 would be an encouraging sign. European Council President Donald Tusk said early on Monday that euro zone leaders reached an unanimous agreement with Greece after all-night talks in Brussels to move forward with a bailout loan for the cash-strapped nation, provided Athens implement tough reforms. “The jury’s still out on whether or not this is going to be accomplished,” said Mark Luschini, chief investment strategist at Janney Montgomery Scott. To receive this third bailout, Greece’s parliament must pass the new rules in areas such as privatization, labor laws and pension reforms by Wednesday. The 86 billion euro ($95.2 billion) in funds would come over three years. In the meantime, euro zone finance ministers were expected to discuss Monday how to keep Greece financed before the bailout deal is reached. Athens faces a 7 billion euro repayment deadline on July 20 to the European Central Bank. The ECB announced it maintains the emergency assistance cap for Greek banks, which will remain closed for at least two more days. The Dow Jones industrial average futures were about 140 points higher before the open. In Asia, stocks surged with the Nikkei up 1.57 percent and the Shanghai Composite leaping 2.4 percent as it extended a recovery from a recent plunge. Art Hogan, chief market strategist at Wunderlich Securities, said the domestic response will likely be less exuberant since the major averages ended last week little changed. Only the Dow eked out a gain, of a mere 0.17 percent. Stocks rose slightly past their opening levels, while bond yields held steady. The U.S. 10-year note yield was 2.44percent and the 2-year held near 0.67 percent. The German 10-year bund yield fell to 0.85 percent. The U.S. dollar extended gains with the euro dipping below $1.10. Also in focus is the Iranian nuclear deal, which would allow more oil exports. Talks on a deal were extended past a June 30 deadline and are expected to reach a conclusion Monday. Crude oil futures settled down 54 cents, or 1.02 percent, at $52.20 a barrel on the New York Mercantile Exchange. Gold futures fell $1.70 to $1,156.20 an ounce in afternoon trade. No economic data or earnings of note were expected Monday. Second-quarter earnings season gets underway with a slew of major reports on Tuesday that include JPMorgan Chase and Wells Fargo. 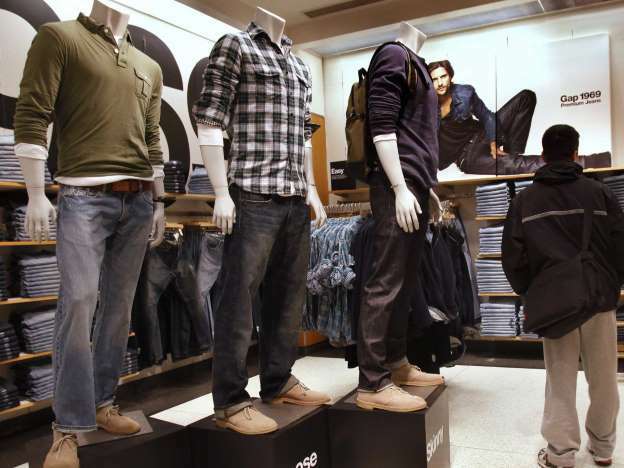 On the economic front, retail sales are due Tuesday morning. “Each data point in and of itself may not be important, but collectively they’re important, especially since there’s a premium on the data,” Krosby said. Federal Reserve Chair Janet Yellen delivers her semi-annual testimony on the economy to Congress on Wednesday and Thursday. “If she focuses on (international news and the dollar) that will give the market a huge boost because she’s more concerned about it than she suggested in her speech Friday,” Krosby said. In other news, the United States posted a budget surplus of $51.8 billion in June, down 27 percent from the same period last year, the U.S. Treasury Department said on Monday. The Dow Jones Industrial Average traded up 211, or 1.19 percent, at 17,972, with Microsoft and Caterpillar leading gains and Merck and UnitedHealth the only decliners. The S&P 500 traded up 21 points, or 1.05 percent, at 2,098, with information technology leading nine sectors higher and utilities the only decliner. The Nasdaq traded up 72 points, or 1.45 percent, at 5,070. 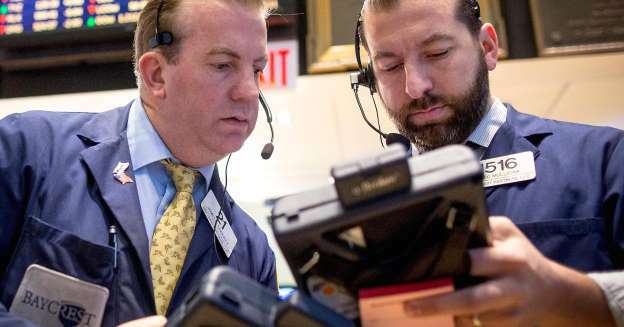 Trading on the New York Stock Exchange in late-morning trade on Wednesday with U.S. stocks extending their losses as continued concerns about Greece and the extended selloff in the Chinese market pressured investor sentiment. “We’ve had some technical malfunctions. Some may be related to connectivity with other exchanges. I believe we’re going to have a temporary pause certainly in a variety of stocks perhaps floor wide,” Art Cashin, director of floor operations at the NYSE, told CNBC, adding that the halt will not cause a move in a particular direction. Other exchanges, however, continued trading normally. The NYSE later said that all open orders amid the halt will be cancelled. “What happens with these situations is often you get a sort of residual result. You’re all clear or you get caught up to date and there’s a little bit of a backlog that pops up somewhere, and it tends to jam things up. So I don’t think any of us has quite enough information yet,” Cashin added. The Dow Jones industrial average traded about 175 points lower when trading was halted as the major averages declined, with the Nasdaq Composite briefly off more than 1 percent as biotechs and Apple (AAPL) plunged more than 1 percent. The iPhone maker was also the worst performing stock in the Dow. The S&P 500 struggled to hold gains for the year. The index dipped into negative territory Tuesday but recovered in afternoon trade to hold slightly higher for 2015. “I think we’re just realigning the U.S. market with the declines elsewhere,” said Peter Boockvar, chief market analyst at The Lindsey Group. In China, the Shanghai Composite closed nearly 6 percent lower despite supportive government measures. The index has fallen more than 30 percent from its mid-June peak amid frequent bouts of extreme volatility. Analysts say the turbulence is starting to unnerve regional investors. European stocks traded higher on Thursday amid hopes of a Greece deal. However, the indices are more than 2 percent lower for the week so far. The Greek government has until Friday morning to present detailed reform proposals to allow a bailout deal by a Sunday summit. Greek Prime Minister Alexis Tsipras addressed the European Parliament on Wednesday, lambasting Europe’s advocacy of austerity and the efficacy of Greece’s bailout programs since 2010, but promised a detailed, “concrete” deal would be presented in the next two to three days. The Federal Open Market Committee (FOMC) minutes at 2 p.m. ET will also be in focus, with traders scanning the Federal Reserve’s June meeting report for hints on interest rate rise timing. The Dow Jones Industrial Average (.DJI) traded down 194 points, or 0.99 percent, at 17,583, with Intel leading decliners and Microsoft (MSFT) the only advancer. 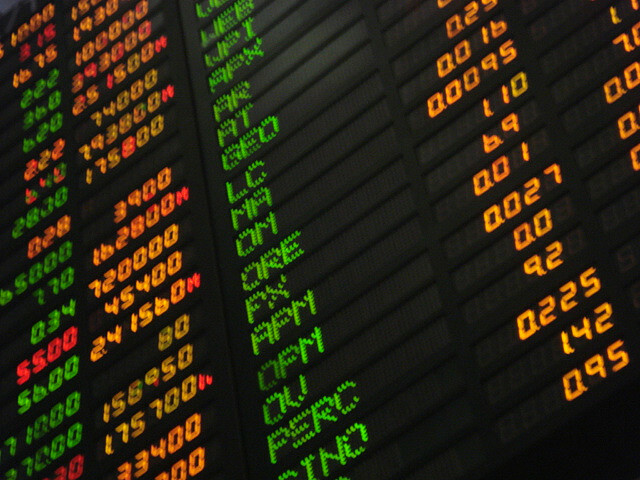 The S&P 500 (.SPX) traded down 23 points, or 1.14 percent, at 2,057, with telecommunications leading all 10 sectors lower. The Nasdaq (.IXIC) traded down 64 points, or 1.31 percent, at 4,931. The CBOE Volatility Index (VIX) (.VIX), widely considered the best gauge of fear in the market, traded near 18. About five stocks declined for every advancer on the New York Stock Exchange, with an exchange volume of 194 million and a composite volume of 1.22 billion as of 11:30 a.m.
Crude oil futures for August delivery lost 81 cents to $51.52 a barrel on the New York Mercantile Exchange. Gold futures rose $7.50 to $1,160.20 an ounce in morning trade. Bond yields held lower, with the 10-year yield at 2.23 percent and the 2-year at 0.57 percent. The Treasury auctions $21 billion in 10-year notes this afternoon. The U.S. dollar fell about half a percent against major world currencies as the euro gained to above $1.10. Earnings season unofficially begins with aluminium producer Alcoa (AA) reporting after the market close.